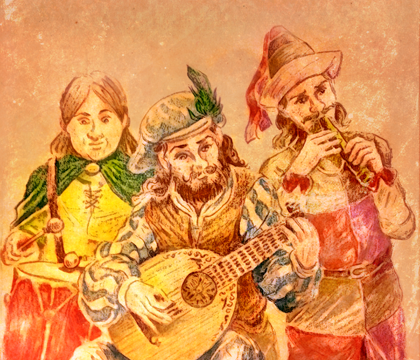 Medieval Music Pack| RPG Maker | Create Your Own Game! Hark! What sounds are these that seem from of old? Music made from lute and recorder, frame drums and harpsichord, verily these are instruments of days gone by. What, then, could be better for games set in medieval times? Naught, I tell you. Hasten, then, to add these twenty tracks to your collection! Lo and behold, now set before you is a plentiful pack of musical tracks that hearkens back to times of old. An age gone by, of kings and knights and chivalrous flights of adventure bold. Hear the lute, viol, and shawm... recorder, harpsichord and drums... crumhorn, bombarde, fidule too. An ensemble of early sounds, tis true. Prithee, add these to your game, to fit the era in sound and name. 20 total tracks including 5 Battle, 4 Dungeon, 3 Field, 3 Theme, and 5 Town tracks! .ogg, and .mp3 formats included. Authentic-sounding instrument and melodies bring a touch of realism to your projects.